The first time I made this cake it was by accident. I received a wonderful chocolate cookbook as a gift, Luscious Chocolate Desserts by Lori Longbotham. I meant to make a different cake from the book, but somehow started this recipe before I realized my error. I never would have purposefully made it because it was flourless and my past experiences with flourless cakes were disappointing. 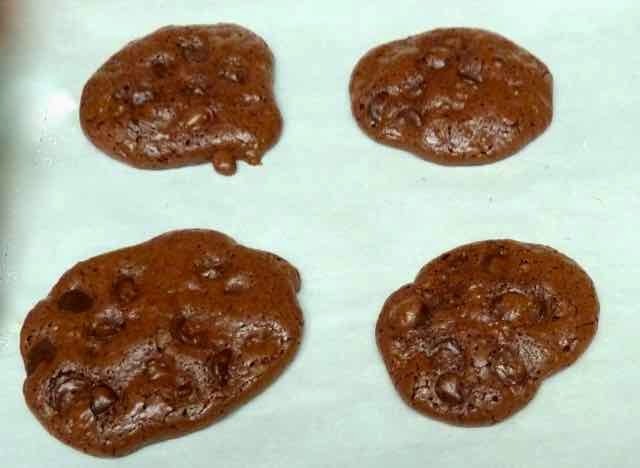 They were all very dense and fudge-like. Well, happy mistake. This cake is light and delightful. 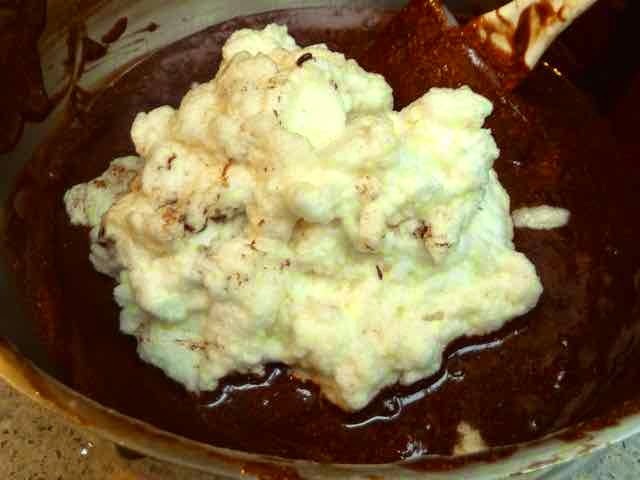 It is decadently rich and amazingly delicious. It’s like eating a wonderful chocolate bar that is soft, fluffy and smooth. You must know how to fold in egg whites to make this cake. 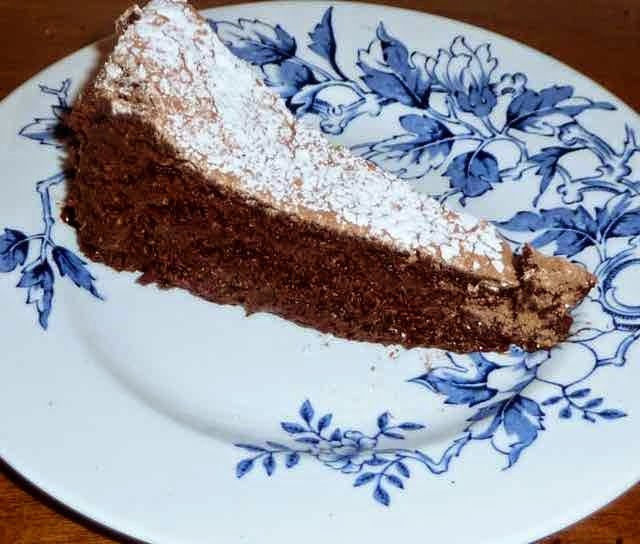 I would recommend that you watch a YouTube video about folding in egg whites or you will have chocolate soup instead of a cake. That said, this is a fairly easy cake to make. Use good quality chocolate for best results. You really taste the chocolate in every bite, so it should be a very good tasting chocolate. I have had issues with the oven temperature given in the recipe. It says to use a 300℉ oven. Maybe it is my oven, but it comes out best if I use a 325℉ or even a 350℉ oven. At the 300℉ temperature the center does not get done enough, in fact it is liquid. At 325℉ the center is soft but not liquid. At 350℉ the center is completely cooked, but soft, only the top gets a bit too crisp. For my taste I like the more done center, but it is delicious no matter what you do to this cake. 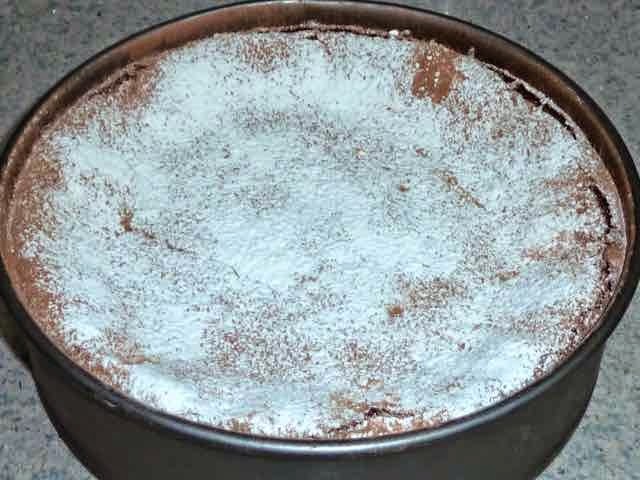 Since it has no flour and no leavening it also makes an elegant Passover dessert. Use good quality chocolate for best results. 3/4 cup + 1 Tbs. Preheat oven to 325℉. Prepare a 9” springform pan by buttering it and then dusting it with cocoa. I put a cardboard cake board on the bottom and butter and dust it to make it easy to move the cake onto a plate and/or to give the cake away without the bottom of the pan. Springform pan greased and dusted with cocoa. Note the bottom has a cake cardboard to make removing the cake easier. 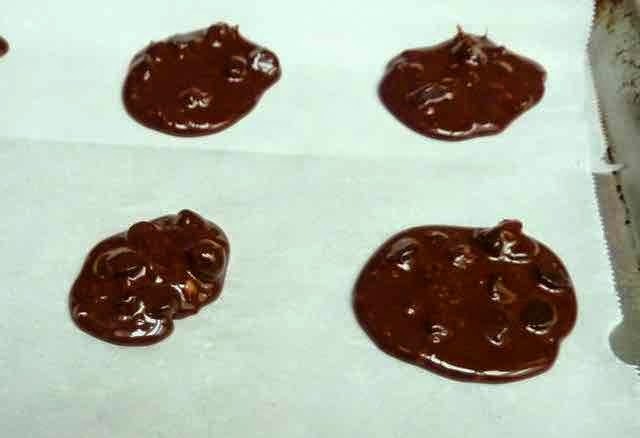 Melt the chocolate and butter in a double boiler over simmering water. Stir frequently until smooth. Remove the top pan and allow the chocolate to cool to room temperature. 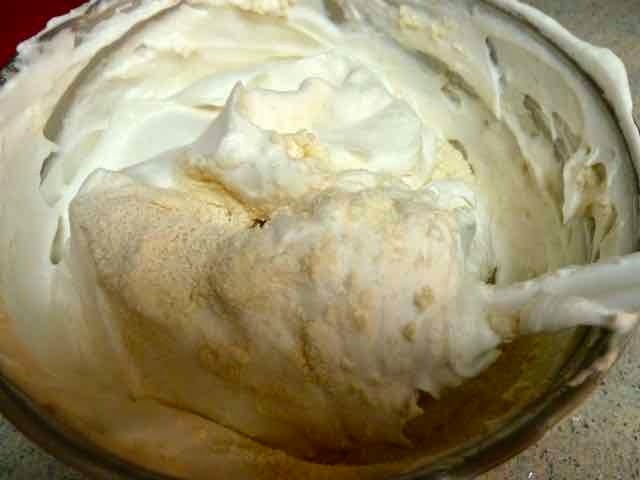 In the bowl using a hand mixer, beat the egg whites until soft peaks form and then beat in the 1 Tbs. of sugar. 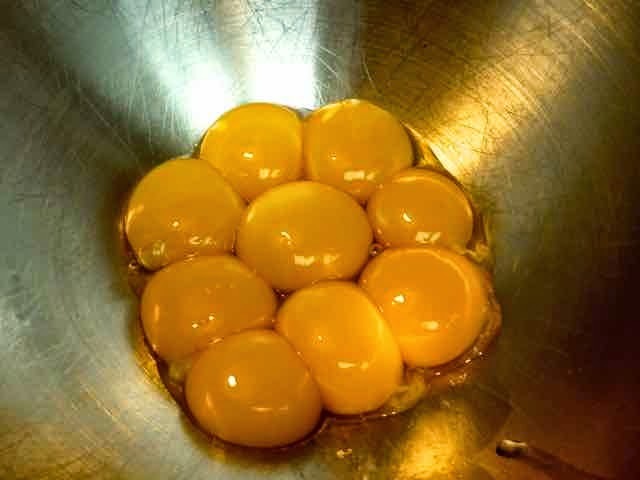 In the bowl of a stand mixer or a separate bowl using a hand mixer, add the egg yolk and 3/4 cups of sugar. 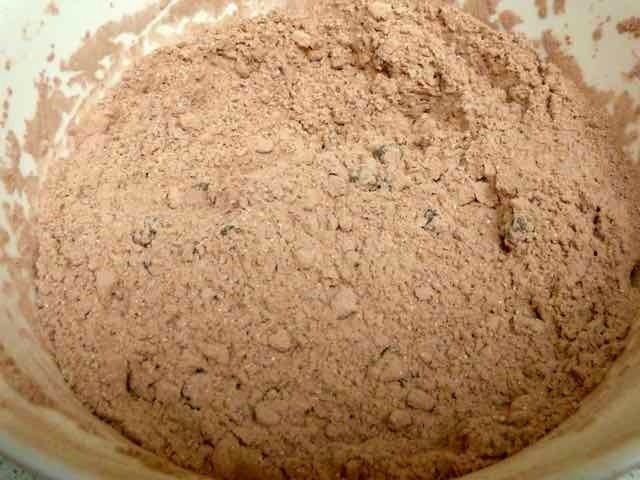 Beat on medium-high speed for 4-5 minutes until the mixture is very pale and thick. Yolks beaten with sugar until light colored and thick. 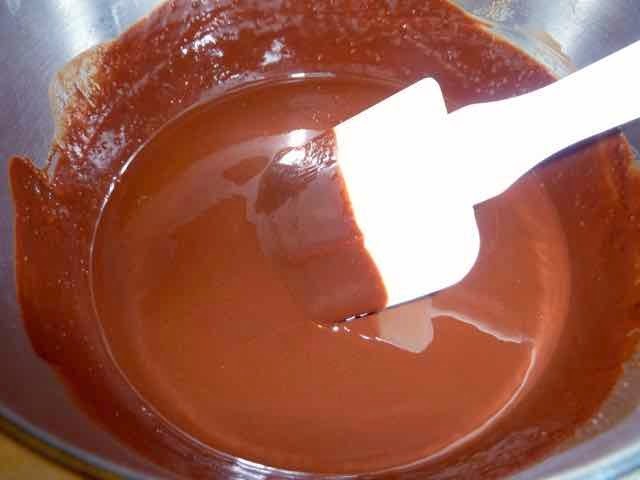 With a rubber spatula fold one-third of the chocolate mixture into the egg yolk mixture. Then fold in one-third of the beaten egg whites. Repeat until all of the ingredients are folded in. Folding in some egg whites. These got beaten too much and are dry and stiff. 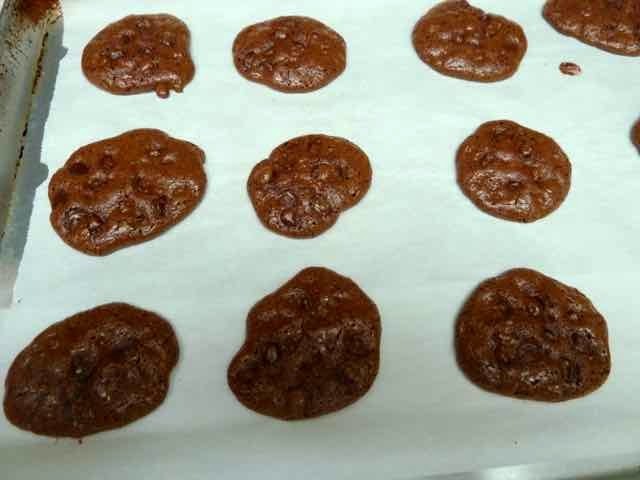 They still worked well, just harder to fold into the batter. Batter after everything is folded in. Pour the batter into the prepared springform pan and smooth the top with the spatula. 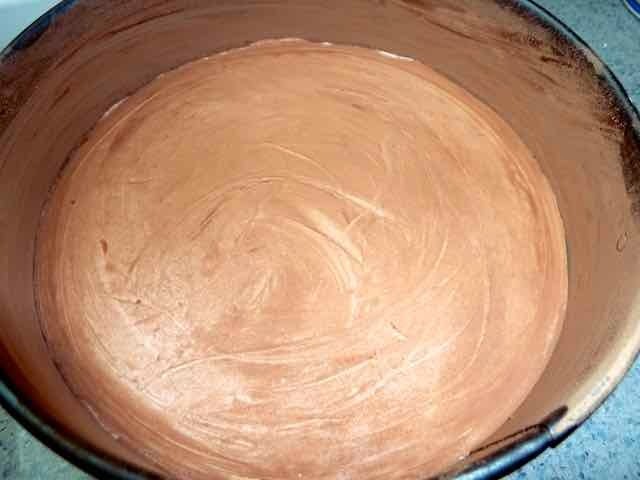 Raw batter in the pan. Bake for about 30 minutes. The center should puff up and the edges should be firm. The center will be a little jiggly. Do not over bake. Note that it puffs up, even in the center. To serve. Run a knife around the edges of the pan. Unlock and loosen the sides of the pan and carefully remove. 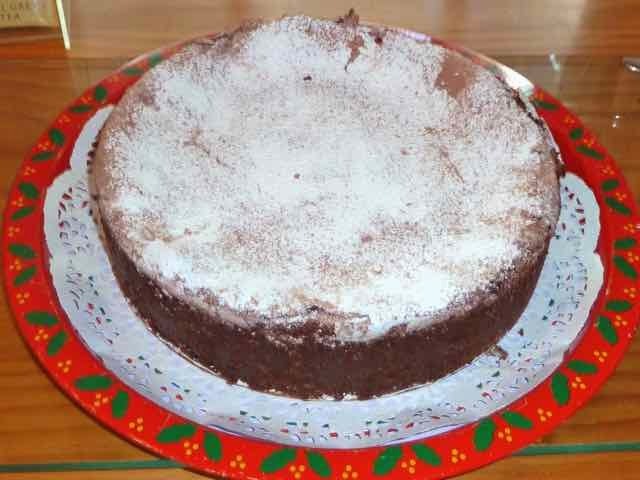 For a nice presentation, dust the top of the cake by sifting cocoa over it , then sifting a layer of confectioner’s sugar over the cocoa. Repeat. I use two different sieves to dust the top, one filled with cocoa and one filled with confectioner’s sugar. 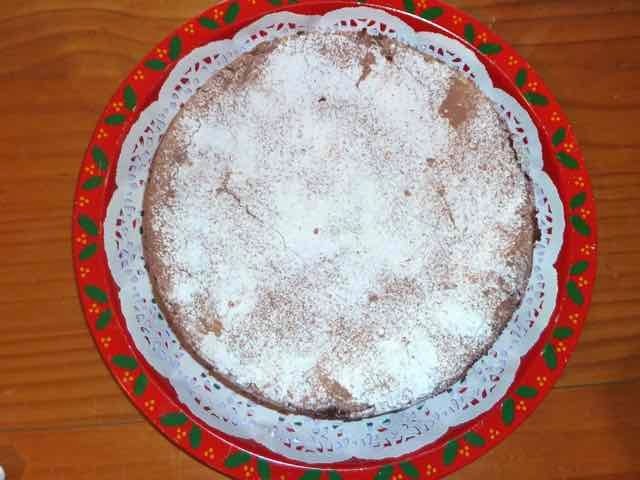 Cake in pan decorated with sifted cocoa and confectioner's sugar. Note that the cake has sunk in the center. Slice the cake into thin slices as the cake is very rich. You can also chill the cake overnight before serving. tray that I did not have to get back. 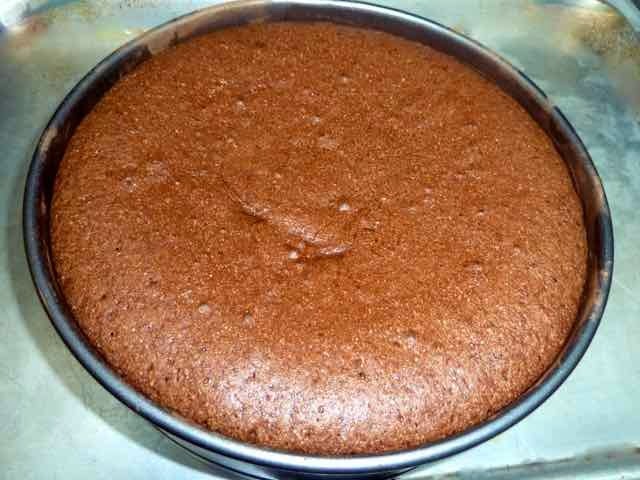 GLUTEN FREE FLOURLESS CHOCOLATE SOUFFLÉ CAKE Ingredients 1 lb. 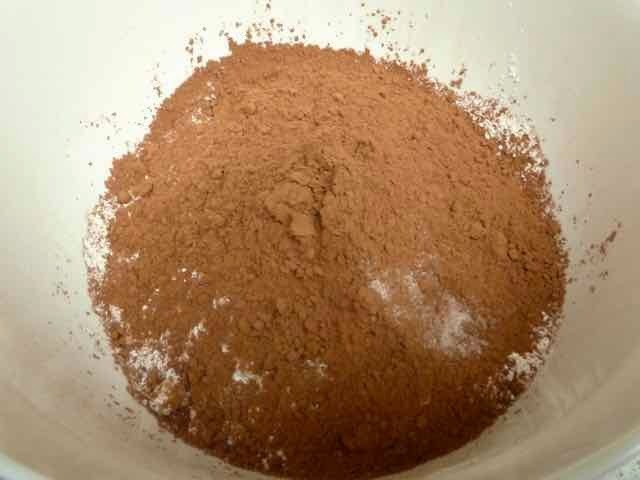 Semisweet Chocolate (you can also use bittersweet or a combination of both) - chopped Use good quality chocolate for best results. 1 cup/2 sticks Unsalted Butter 9 large Eggs - separated 3/4 cup + 1 Tbs. 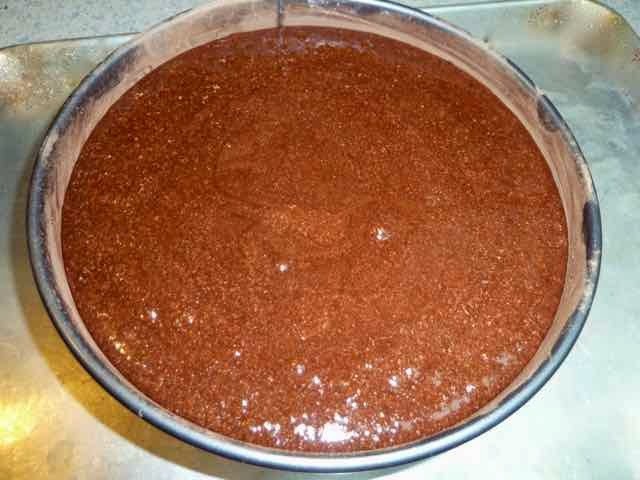 Sugar For dusting the baked cake: Confectioner’s Sugar and Unsweetened Cocoa Directions Preheat oven to 325℉. Prepare a 9” springform pan by buttering it and then dusting it with cocoa. I put a cardboard cake board on the bottom and butter and dust it to make it easy to move the cake onto a plate and/or to give the cake away without the bottom of the pan. 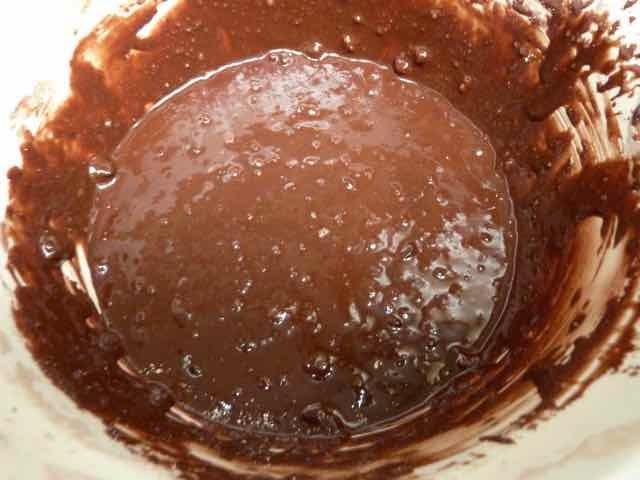 Melt the chocolate and butter in a double boiler over simmering water. Stir frequently until smooth. Remove the top pan and allow the chocolate to cool to room temperature. 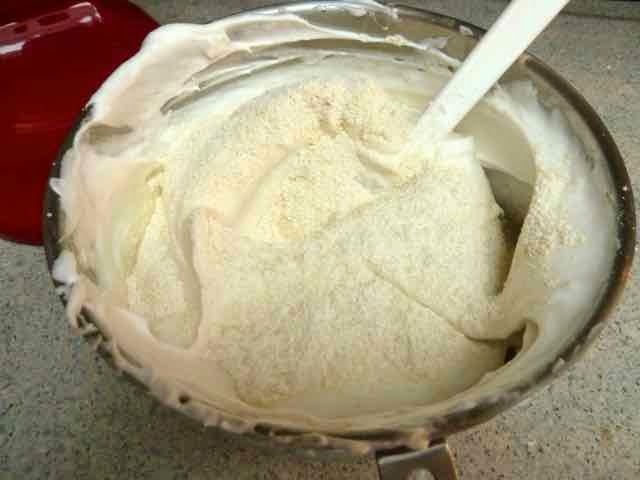 In the bowl using a hand mixer, beat the egg whites until soft peaks form and then beat in the 1 Tbs. of sugar. 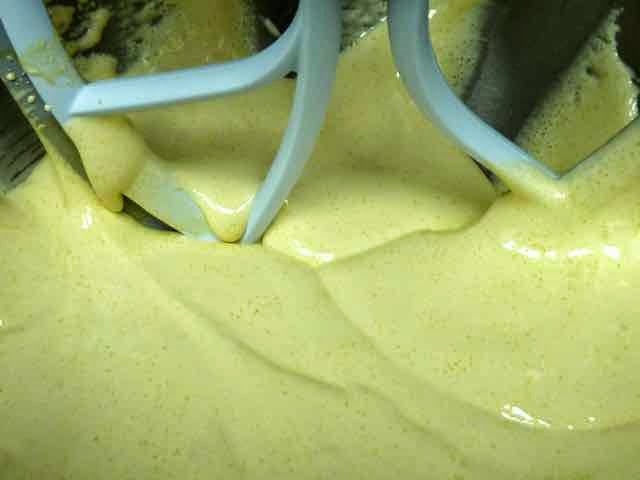 In the bowl of a stand mixer or a separate bowl using a hand mixer, add the egg yolk and 3/4 cups of sugar. 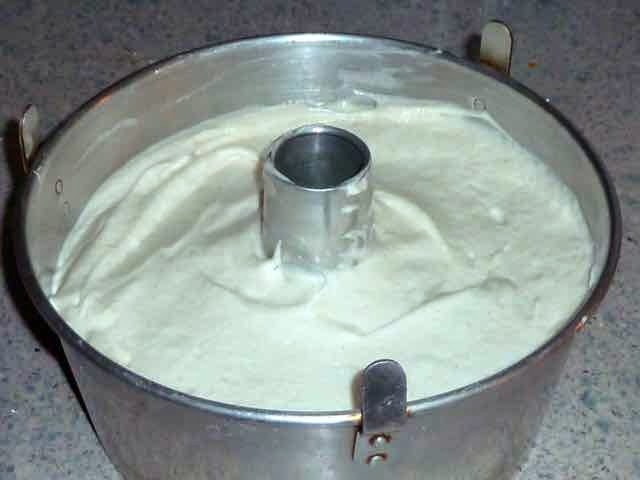 Beat on medium-high speed for 4-5 minutes until the mixture is very pale and thick. With a rubber spatula fold one-third of the chocolate mixture into the egg yolk mixture. Then fold in one-third of the beaten egg whites. Repeat until all of the ingredients are folded in. Pour the batter into the prepared springform pan and smooth the top with the spatula. Bake for about 30 minutes. The center should puff up and the edges should be firm. The center will be a little jiggly. Do not over bake. Cool completely on a wire rack. To serve. Run a knife around the edges of the pan. Unlock and loosen the sides of the pan and carefully remove. 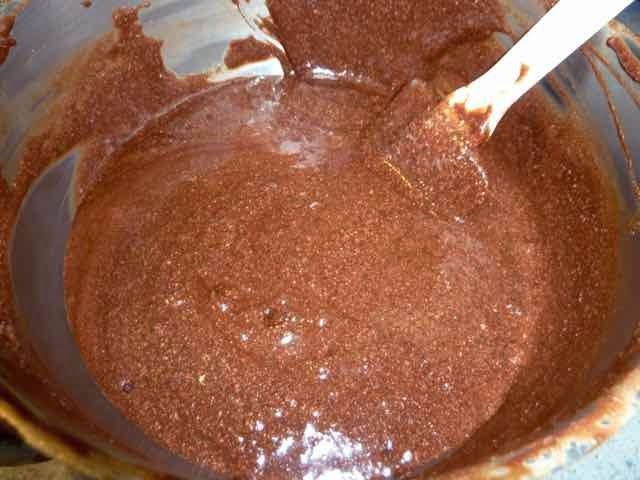 For a nice presentation, dust the top of the cake by sifting cocoa over it , then sifting a layer of confectioner’s sugar over the cocoa. Repeat. I use two different sieves to dust the top, one filled with cocoa and one filled with confectioner’s sugar. Slice the cake into thin slices as the cake is very rich. You can also chill the cake overnight before serving. With lots of egg whites saved from recipes using only yolks, baking an angel food cake seemed like a good idea. 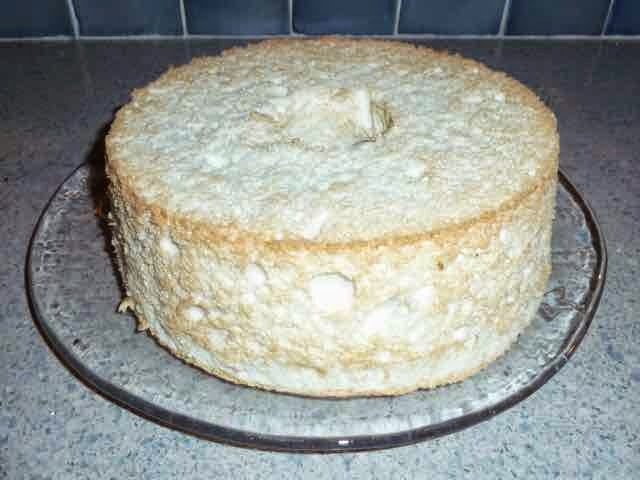 I never tasted a home made angel food cake until I was an adult and before that I could not understand why people ate them. 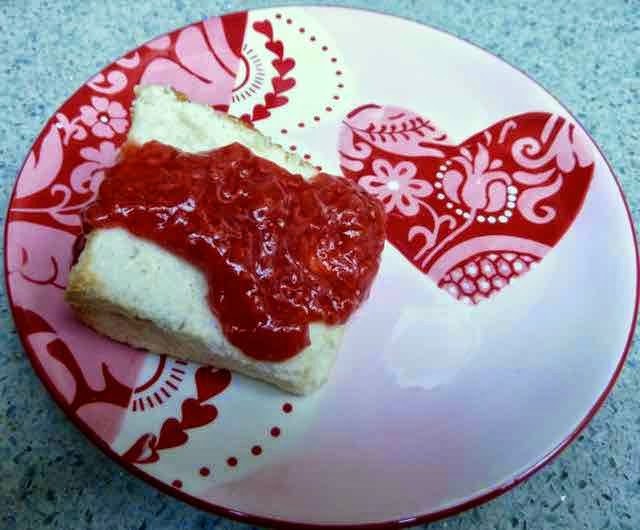 Unlike the ones sold in stores, home made angel food cake is moist, light and delicious with a delightful texture. 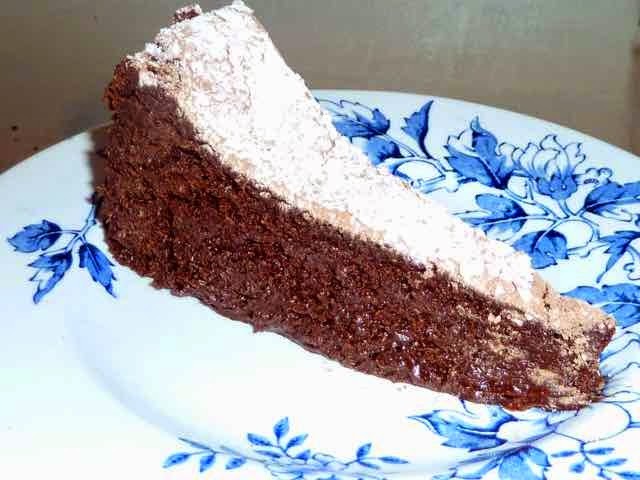 Eaten plain or with toppings such as fruit sauce and or whipped cream this cake is a real treat. 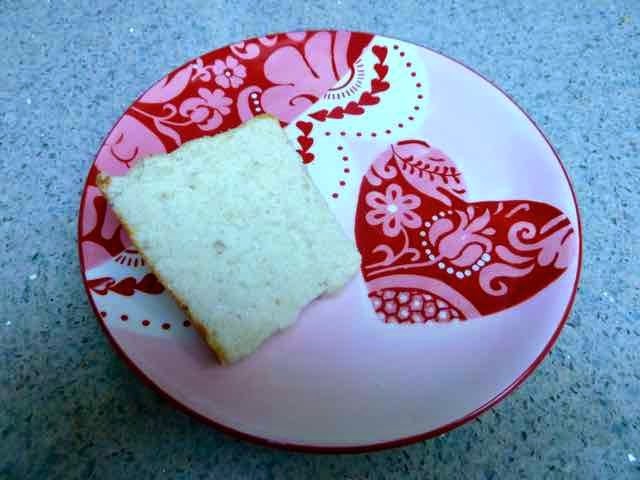 I used a traditional recipe from Martha Stewart and converted it into a GF version. 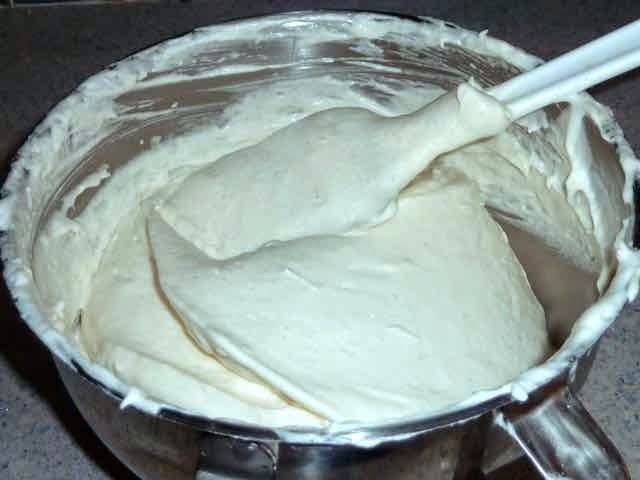 With a stand mixer or using a hand held electric mixer it is easily and quick to make. It is best served the day you make it. Preheat oven to 350℉. 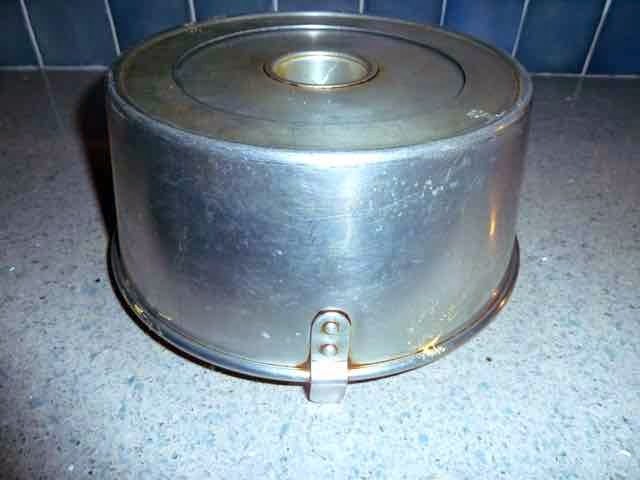 You will need a 10-inch angel food pan or a tube pan with a removable bottom. Do NOT grease the pan. with feet to keep the cake elevated as it cools. In a medium sized bowl add the flours, xanthan gum and 3/4 cup of sugar. Mix well. Set aside. 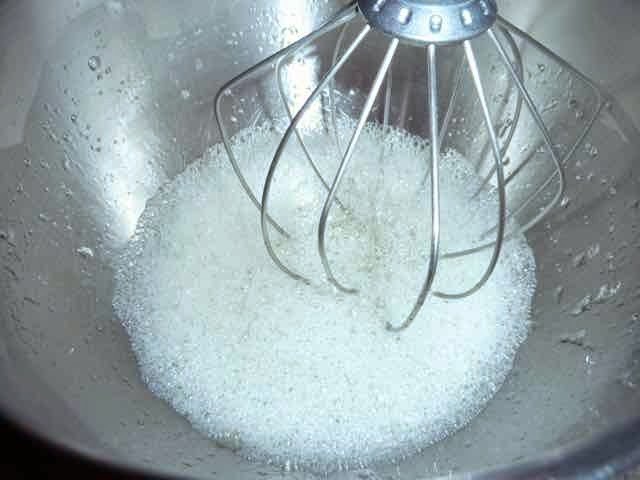 In the bowl of a stand mixer add the egg whites and water. Using the whisk attachment whip until foamy. 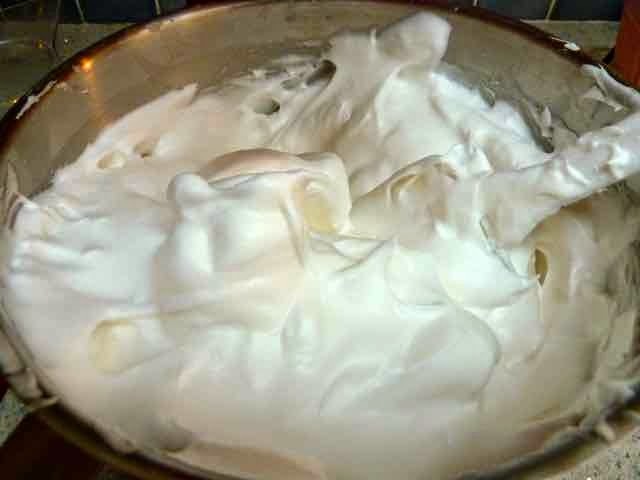 Egg whites whipped until foamy. Add the salt, cream of tarter and vanilla to the egg whites and beat, on medium speed, until soft peaks form. Egg whites, cream of tarter and vanilla whipped to the soft peak stage. Continue beating the egg mixture while adding the remaining 3/4 cup of sugar, one tablespoon at a time until stiff, but not dry. Egg whites and sugar all whipped. In six additions, sift the flour mixture over the stiff egg whites. 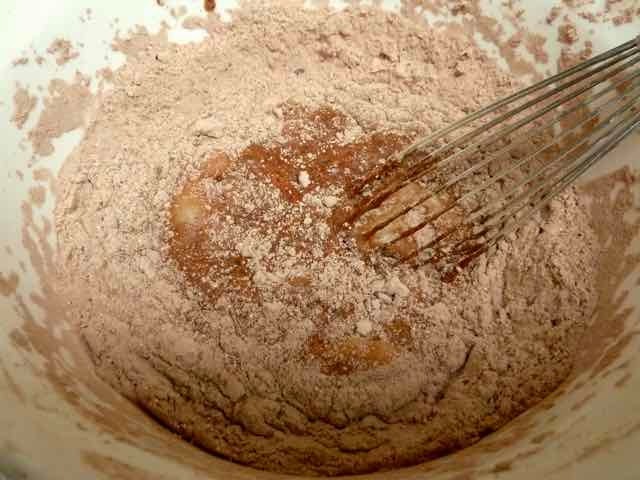 Fold in the flour mixture after each addition. Some of the flour mixture sifted onto the egg whites. Folding the flour into the egg whites. The egg whites after all the flour has been added. Scoop the mixture into the angel food or tube pan. Run a knife through the batter to eliminate any air pockets and then smooth out the top with a silicone spatula. Bake about 35-40 minutes until the cake is golden brown and springs back when pressed. Do not over bake. Turn the cake pan upside down to cool completely. If your pan does not have feet then turn the cake upside down and place the center ring over a wine bottle to keep it elevated. When cool, run a knife or offset spatula around the inner and outer edges of the pan. Slide the side ring off the pan while holding the center of the pan. Run a knife along the bottom of the cake to release the cake. I like to serve it with the bottom up but you can serve it any way you like. 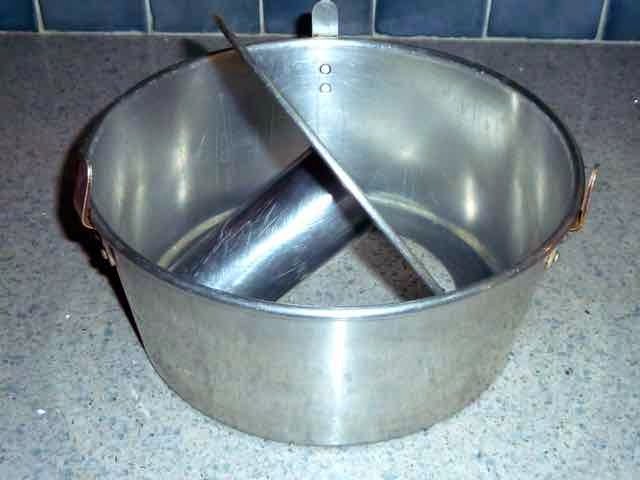 A sharp rap of the pan when the cake is inverted will also release the cake. Just do this over a plate or baking sheet. Serve plain or with a fruit or fruit sauce and or whipped cream or non dairy topping. Some people like it with chocolate sauce. 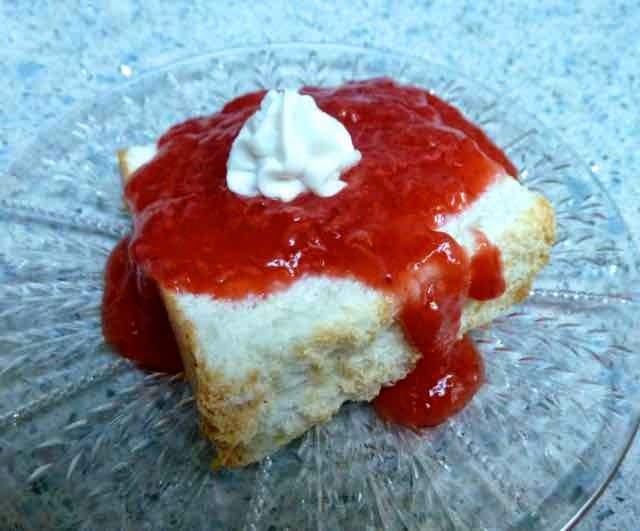 A slice of cake with homemade strawberry sauce. It is best when served the day it is baked. Left over cake will keep a few days at room temperature or in the fridge. It is best to slice the cake using a serrated knife. The cake is also wonderful plain. 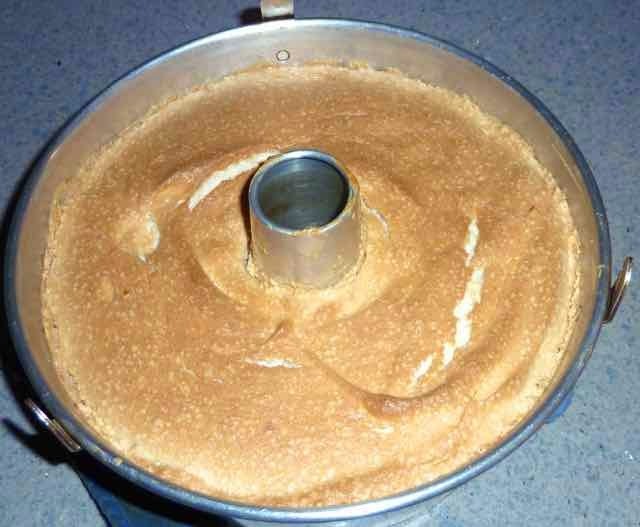 GLUTEN FREE DAIRY FREE ANGEL FOOD CAKE Ingredients 1/2 cup Tapioca Flour 1/4 cup Chickpea Flour 1/4 cup Sorghum Flour 1/2 tsp. Xanthan Gum 1 1/2 tsp. Cream of Tarter 1/4 tsp. Sea Salt 1 1/2 cup Sugar - divided 1 3/4 cups/about 14 large Egg Whites - room temperature 1 Tbs. Water 1 1/2 tsp. Vanilla Extract 1/2 tsp. Almond Extract Directions Preheat oven to 350℉. You will need a 10-inch angel food pan or a tube pan with a removable bottom. Do NOT grease the pan. In a medium sized bowl add the flours, xanthan gum and 3/4 cup of sugar. Mix well. Set aside. 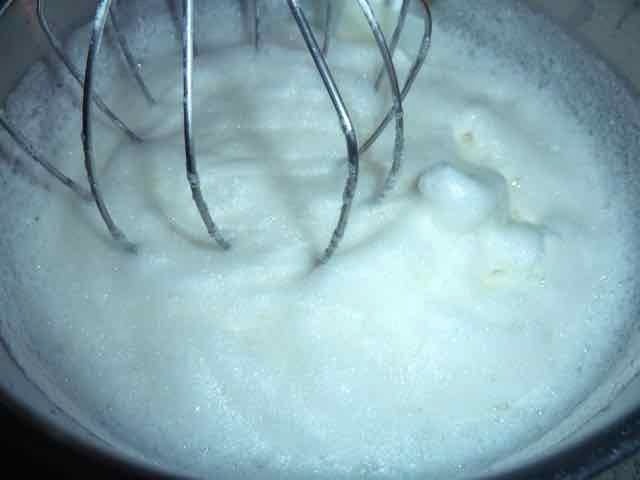 In the bowl of a stand mixer add the egg whites and water. Using the whisk attachment whip until foamy. Add the salt, cream of tarter and vanilla to the egg whites and beat, on medium speed, until soft peaks form. Continue beating the egg mixture while adding the remaining 3/4 cup of sugar, one tablespoon at a time until stiff, but not dry. In six additions, sift the flour mixture over the stiff egg whites. Fold in the flour mixture after each addition. Scoop the mixture into the angel food or tube pan. Run a knife through the batter to eliminate any air pockets and then smooth out the top with a silicone spatula. Bake about 35-40 minutes until the cake is golden brown and springs back when pressed. Do not over bake. Turn the cake pan upside down to cool completely. If your pan does not have feet then turn the cake upside down and place the center ring over a wine bottle to keep it elevated. When cool, run a knife or offset spatula around the inner and outer edges of the pan. Slide the side ring off the pan while holding the center of the pan. Run a knife along the bottom of the cake to release the cake. I like to serve it with the bottom up but you can serve it any way you like. A sharp rap of the pan when the cake is inverted will also release the cake. Just do this over a plate or baking sheet. Serve plain or with a fruit or fruit sauce and or whipped cream or non dairy topping. Some people like it with chocolate sauce. It is best when served the day it is baked. Left over cake will keep a few days at room temperature or in the fridge. It is best to slice the cake using a serrated knife.